It’s 12:20 AM Friday morning. I’ve just said goodbye to my bus mates—no, to my friends. It’s a sad occasion. Not like death or even like seeing a child off to college, but there is a weight on me, nonetheless, a stone of sadness. I find it odd that in so short a time, only eight days, I’ve come to enjoy, to care about, and, okay, even to love these people. Time is a strange commodity. In the middle of an experience, the minutes can stretch out in long, silly putty increments. The ride between Albany and Buffalo, for example, when we were all exhausted and the bus rolled on and on as if we were part of a Twilight Zone episode in which, in the end, we discover that we’re really in hell and doomed to ride the damned bus forever. But sitting here at the desk in my hotel room, with the talk and the laughter and the intimate connection between us so apparent in our last meal together, the eight days seem to have sped by, a breath or two and done. I don’t know how Atria Books will judge the success of the Great Mystery Bus Tour. I hope that whatever gauge they use, the enterprise rises to the hoped-for mark. In terms of those of us in the trenches—the authors, our “handlers” (the great folks from Atria publicity who facilitated everything), and our phenomenal bus guys—the week was nothing short of stellar. We loved the whole idea, we enjoyed the events immensely, and we were given the gift of each other. From the road, this is my final dispatch. 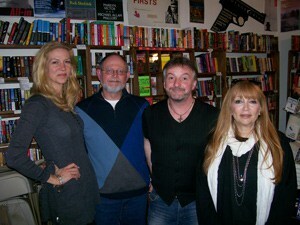 Here’s a photo of me with my busmates, taken at Once Upon A Crime, the fine mystery bookstore in Minneapolis. I haven’t blogged about them yet, which is a terrible oversight, because they’re a grand group. I’ll start with Liza Marklund. Before we launched, Liza (it’s pronounced Leesa) was the author I was most uncertain about. Statuesque, lovely, colossally successful in Sweden and Europe, several of her books already in film, she seemed to me the author most likely to be a prima donna. Thank God nothing could be farther from the truth. What a great and gracious woman. Not only is she a talented writer, she’s down to earth and very funny. She’s not well known in this country yet (but that will change) and so at our events, she doesn’t have the hundreds of adoring readers crowding into the bookstore that she would draw were our signings in Europe. I asked her how she felt about that, and her reply was that it troubled her not at all, that she’s building a following here, and that all good things take time. Lovely and wise, what a killer combination. I expected to be intimidated by M.J. Rose. For those of you not in the book business, the skinny on M.J. is that she’s a whiz at marketing books. She owns her own company, AuthorBuzz, which does just that. Before embarking on the tour, I read her most recent novel, The Book of Lost Fragrances, and loved it. The research is awesome. The storyline is compelling. The writing is silk smooth. I thought to myself, Here’s one very smart woman who’s going to make me feel like a dumb donkey. M.J. is smart. M.J. is savvy. And M.J. is delightful. She has a marvelous sense of humor, and if you’re not following her blog or her tweets, you’re missing out on some fall-on-the-floor-laughing commentary. Okay, John Connolly. John’s the only one of the authors I knew in advance, but I didn’t know him well. I know him better now, and fully fleshed out, this guy is the kind of author we all aspire to be. Please don’t tell him I said that! In my estimation, he stands beside James Lee Burke as one of the finest prose writers in our genre. He also a keen sense of both the art and the business of books, and when he defends the brick and mortar bookstore, he’s articulate and even a little scary in his passion. (The other night while he was ranting eloquently, I saw a blood vessel throbbing in his temple like one of those creatures from Aliens ready to burst through his skin!) And did I say funny? The man’s a walking comedy club. So, humor is clearly a big part of what makes this tour so delightful. We don’t any of us take ourselves too seriously, and all of us are more than willing to be nakedly human. Okay, maybe “nakedly” was the wrong word. I really don’t want you—or my wife—to get the wrong idea about what happens on the Mystery Bus. That’s all for now. More down the road. It all began with toilet paper. If you’ve been reading my blog, you know that the Great Mystery Bus Tour’s first crisis was a dearth of toilet paper. Yesterday the crisis escalated to rebellion. We learned that we were using the bus toilet incorrectly. (Probably the reason we ran out of toilet paper.) Apparently, of the options available to human beings for the body’s elimination of waste, only one is allowed on the bus. I mean number one. And no toilet paper is allowed to be flushed down with any elimination. Who knew? The result is a situation with the waste pipe in our mammoth vehicle that, in human beings, would require a good deal of Ex-Lax. And as I understand it, in order to remedy the situation, our driver has to do to our drain pipe what James Herriot, the young vet in All Creatures Great and Small (if you remember the book or the fine BBC production made from it), was forced to do to clear the bowels of a plugged cow. Believe me, whatever they’re paying our driver, it ain’t enough. At any rate, we’ve learned our lesson, and now when one of us hears nature’s delicate call, we simply indicate that we “need to make an important phone call,” and the driver will find the nearest clean “phone” along the highway. Two events yesterday: the first at Centuries and Sleuths, a lovely mystery bookstore in Forest Park, IL; the second in Milwaukee, WI, at the very intimate Mystery One. Milwaukee has lovely real estate, especially on the shoreline of Lake Michigan. 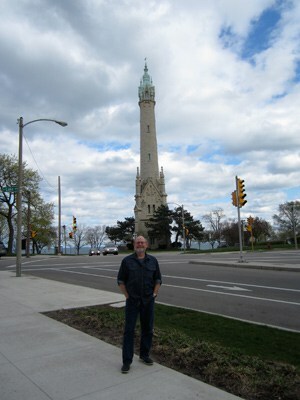 Here’s a photo of me in front of an impressive water tower near the shore. Events today in two of my favorite stores—Booked For Murder in Madison, WI, and Once Upon A Crime (my hometown store) in Minneapolis. That’s all for now and here’s hoping I don’t have to make any “important phone calls” along the way. It had been such smoothing sailing on the Great Mystery Bus Tour, with all things going swimmingly. Then disaster struck. We ran out of toilet paper for our little bus bathroom! This was in the deep, dark hours late at night. We stopped at a convenience store to replenish the supply. Gadzooks—they didn’t sell toilet paper! But resourceful authors that we are, we realized that we have lots of our books on board, so we drew straws to see whose was the first to sacrifice pages. I’ve been sworn to secrecy on the outcome of that particular lottery. Second crisis: We are currently headed toward a long line of severe weather. Books and Co. in Dayton, OH, is our next event stop. South and west of Dayton is a turbulent storm front that is producing tornadoes at an alarming rate. Five people have been killed already. North and west of Dayton is another front with violent storms along the leading edge. We have a very small chance that we might be able to slip through the narrow clear area between these two storm systems, but it will be akin to threading the eye of a needle. So, stay tuned. Who knows? This could be my last dispatch from the road. On the Road At Last! The Great Mystery Bus Tour bus is awesome. It’s got marble floor tiles, granite counters, plush leather seats, HD television, WIFI, and a well stocked larder. But there’s a flaw. A minor one, but flaw nonetheless. The outside cover of the bus that so boldly displays our book covers also, for the most part, blocks our view out the windows. Yesterday, as we sped out of New York, across Connecticut and Massachusetts, into Vermont, I had no idea of the nature of the country we traveled through. Brattleboro is the oldest town in the state and also is the site of the first U.S. printing of the first Harry Potter book. Brattleboro is mention repeatedly in David Foster Wallace’s Infinite Jest. 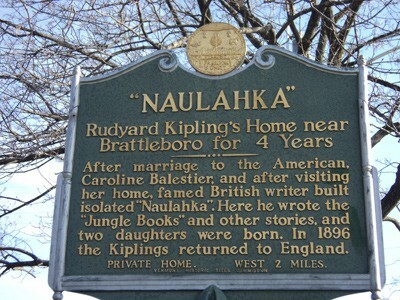 Rudyard Kipling built a home, which he called Naulakha, just outside Brattleboro where he lived with his wife, a native of Brattleboro, for several years. Here’s a photo of the plaque commemorating Kipling and his home. 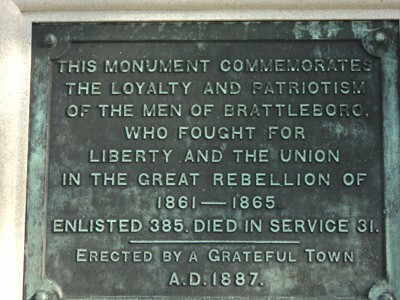 The next photo is of another plaque in one the town parks, affixed to an impressive monument erected in memory of the Vermont soldiers who fought in the Civil War. The monument was erected in 1887. Check out the name that, in Vermont in 1887, they gave to the Civil War. When I lived in Texas, it was referred to as the “War of Northern Aggression.” All a matter of perspective. On tap today, an event at Mystery on Main Street here in Brattleboro, then we shoot to Albany, New York, for an evening event.